Our top-priority is keeping Discovery Ridge residents informed. 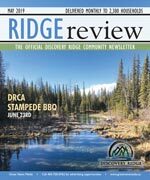 All the community’s must-know news is easily accessible through the Discovery Ridge community newsletter, which is published monthly so that residents are kept current on relevant community and Calgary news. Discovery Ridge Review is delivered monthly to every household, apartment, and business, and is a great way to get hyper local advertising exposure. The DRCA is responsible for planning sports facilities, developing communication tools such as the DRCA Newsletter, taking care of the daily finances of the DRCA and bringing the community together through social events. The Board is made up of volunteer members of our community, and DRCA activities are funded by donation and memberships. In the City of Calgary’s 2012 municipal census, Discovery Ridge had a population of 4,350 living in 1,649 dwellings, a 0.7% increase from its 2011 population of 4,321. With a land area of 3.6 km2 (1.4 sq mi), it had a population density of 1,208/km2 (3,130/sq mi) in 2012. Residents in this community had a median household income of $128,844 in 2000, and there were no low income residents living in the neighborhood. As of 2000, 32.3% of the residents were immigrants. Most buildings were single-family detached homes and estate homes and none of the housing was used for renting. For more detailed info visit the City of Calgary community profiles site.